“And it’s been ‘on the bench’ for at least eight of those! But the reason I have mine is quite simple – nothing, but nothing, looks like a Stinger. It’s that long thin tank, the high level exhausts, that frankly mad looking engine and, of course, the apparent lack of frame tubes at the front. I first became fascinated by these strange little bikes in 1973 when a trio of them used to park up at college; from then on it was always a must have bike. This example is a fairly early Mk2 that originally came with a black exhaust which was too far gone to be used in the restoration. Mk2s are often seen with braced handlebar and braced front guard but this one came with original low bars and plain front guard. Suzuki had a very haphazard approach to what they fitted as ‘standard’ back in the 70s! The bike has been the subject of a long and painful restoration being featured on and off in Classic Motorcycle Mechanics magazine. Discovered as a genuine barn find, the V5 log book showed only two owners yet the mileage was up at 20,945. 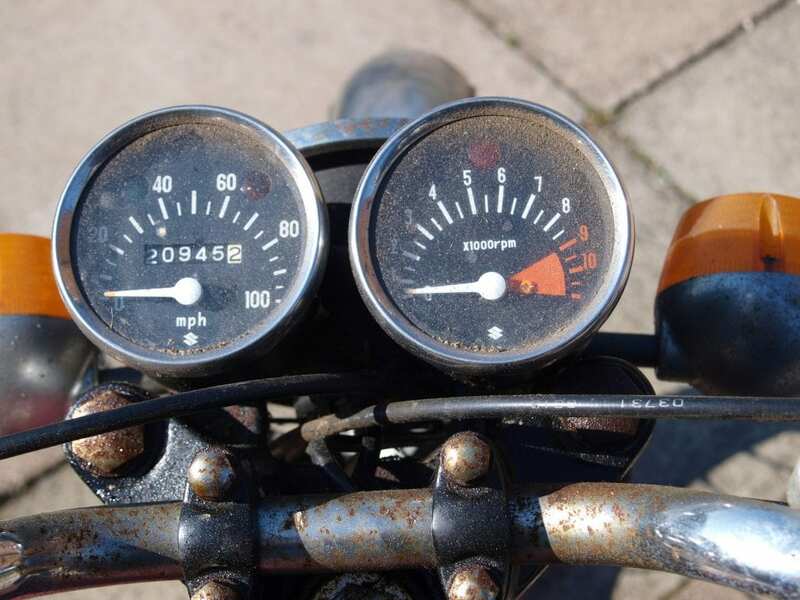 It seemed the bike had been used long term as a commuter hence the relatively high mileage. Every single part of the bike was variously rusted, seized, broken or totally worn out. The pistons had corrosion welded themselves to the bores necessitating serious brute force and sharp tools to even start on the engine rebuild. The blind bearing on the gearbox output shaft was worn so badly the needle rollers were actually triangular. The shaft itself was three millimetres undersize and this was probably what took the bike off the road. Spares for the restoration were sort from around the world. 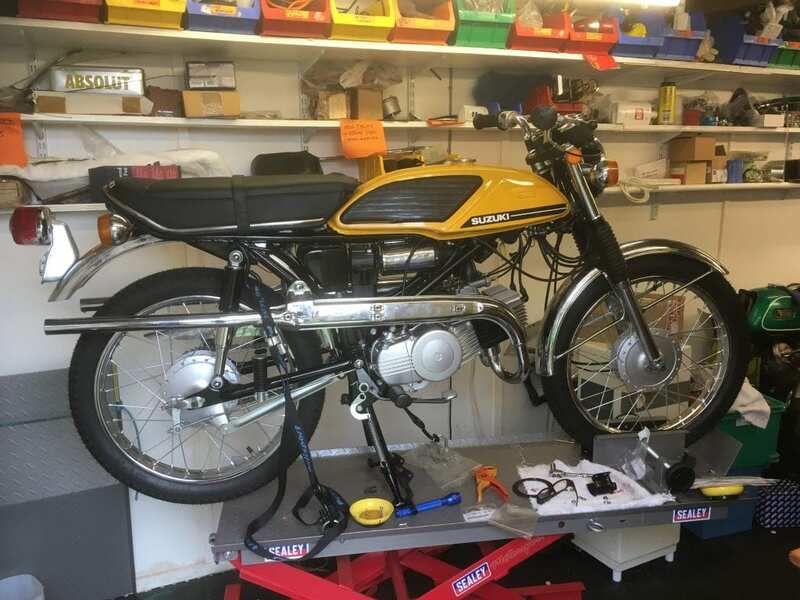 A second hand gearbox was sourced from the USA, the conrods from Singapore, the four main bearings each from a separate UK dealership, the inlet rubber from Switzerland, the air box from Australia and clutch cable holder from France. The majority of the bike is mainly still original as I wanted to retain some of its history. The cylinder heads still bear witness to salt corrosion and the battery box base is still pockmarked from acid fumes. The tank is the original one and has been subject to a lot of lead puddling. Next Post:NMM ‘Live’ Is On!